A Pensacola police officer was placed on administrative leave Saturday after his cruiser ran over and killed a young male in Brownsville. Pensacola Police Department Chief John W. Mathis said Officer Jerald Ard, 35, had been placed on administrative leave pending the results of an investigation by the Florida Department of Law Enforcement. "It's obviously a very tragic and unfortunate incident," Mathis said. "My heart goes out to the subject in this case and his family. We'll just have to see how this plays out." According to a Saturday afternoon news release, Ard saw a suspicious man in a construction site about 1:50 a.m. Saturday, while he was on routine patrol near Cervantes and T streets. The man left the scene on a bicycle and Ard pursued, attempting to stop him using verbal commands and blue police lights, the release said. The officer also tried unsuccessfully to shock the fleeing man with a Taser stun gun, according to the release. After the Taser was fired, the man turned into the parking lot of a vacant business near R Street, crashed his bicycle, and was run over by the pursuing police car, according to the release. The man, who remained unidentified Saturday afternoon, was pinned beneath the car during the crash, and was pronounced dead at the scene. Kristen Perezluha, a spokeswoman for the Florida Department of Law Enforcement, said investigators were not ready to release any additional details about the crash. "We are investigating, but we're not releasing any details at this point," Perezluha said. Perezluha said her agency will handle the "use of force" aspect of the case and the Florida Highway Patrol will investigate the crash. "We're handling it the same way we handle officer-involved shootings," she said. "Generally we complete our investigation and turn the information over to the State Attorney's Office." Assistant State Attorney Greg Marcille said his office was contacted Saturday morning and will await the results of the investigation before deciding whether charges will be filed against Ard. For more than four hours Saturday morning, investigators took photographs and measurements and placed small cones along the road and the grass to mark the trajectory of the bicyclist and the police cruiser. As many as a half dozen patrons attending a concert across the street at the music venue Sluggo's, said they saw Ard pursuing a young black male with dreadlocks on a bicycle eastbound on Cervantes Street shortly before 2 a.m. Witnesses said they saw Ard fire a stun gun out the window of his moving cruiser at the fleeing suspect immediately before the crash. Jamison Boler was seated outside with at least seven friends when they saw the blue lights of the police car, then noticed the male on a bike heading east, toward the Pace Boulevard intersection. "The man on the bike was on the sidewalk, boogeying down, trying to get away," Boler said. "The policeman fired a Taser out the window. The guy (on the bike) made a U-turn and ditched the bicycle and kind of did a somersault on the ground. "Not two seconds later, the cop car just ran over him," Boler said. "The cop ran up on the curb and hopped out of the car and said, 'Where are you at?' The guy was still underneath his car. You can still see his red shoe sticking out." Another witness, David Taylor, 25, said the male, who appeared to be a teenager, was dragged after being stuck beneath the police car. "The kid fell off the bike (after being shocked with a stun gun) and then was stumbling because of the momentum," Taylor said. "It was probably about 10 to 15 feet that the man was drug." The police car came to a stop about 35 feet from the male's bicycle. The man remained pinned beneath the car for more than three hours before the car was removed and his body was taken away. Police cordoned off the block of Cervantes as a crowd of concertgoers and passersby looked on. The police later moved the crime scene tape farther from the street because they said the onlookers were hampering the investigation. Authorities Monday released the identity of the teenager killed early Saturday as he fled a Pensacola police officer. Victor Demarius Steen of Pensacola, 17, died pinned beneath the wheels of a Pensacola police cruiser, Mike Morrison, a spokesman for the Florida Department of Law Enforcement said. Steen's parents did not wish to comment Monday evening. At the time of the incident, Steen was unidentified. Investigators found a cell phone at the scene of the incident and used it to contact a family member who identified Steen's body. Meanwhile, patrolman Jerald Ard, 35, who ran over Steen, was described by a police union lawyer as distraught after the incident. "Obviously this was a tragedy for everyone involved," attorney Roy Kinsey said. "Ard was extremely upset that this happened." Ard, a graduate of Tate High School, has been an officer for four years. He also spent more than four years in the Army, serving in the infantry. Ard's police personnel record reveals that his driver license was suspended at one time but gives no information on when or why. It was reinstated by the time he became an officer in November 2005. The personnel file says Ard was involved in a minor traffic crash while on duty and has made two improper arrests. The file also contains four notes of commendation for assisting citizens, including two visitors with flat tires. Ard was on patrol about 1:50 a.m. Saturday when he saw Steen at a construction site near Cervantes and T streets in Brownsville. When Steen rode away on a bicycle, Ard pursued him, turned on his cruiser's flashing lights and ordered him to stop, a police news release said. When Steen didn't stop, the officer tried to shock him with a Taser. After the Taser was fired, Steen turned into a parking lot of the Wachovia Bank near R Street, crashed his bicycle and was run over by the pursuing cruiser, police said. Whether the Taser probe struck the teenager is still unclear. According to Ard's records, he was granted advanced Taser certification in 2006. He scored 100 percent on a Taser quiz in May 2008 and 97 percent on a second quiz in September 2008. Ard was placed on leave pending the outcome of an FDLE investigation. The results of that investigation will be turned over to the State Attorney's Office, which will decide whether to pursue criminal charges. The investigation could take weeks to complete. Pensacola police said they could not release the dashboard video footage from the incident saying that it was part of the FDLE's ongoing investigation. 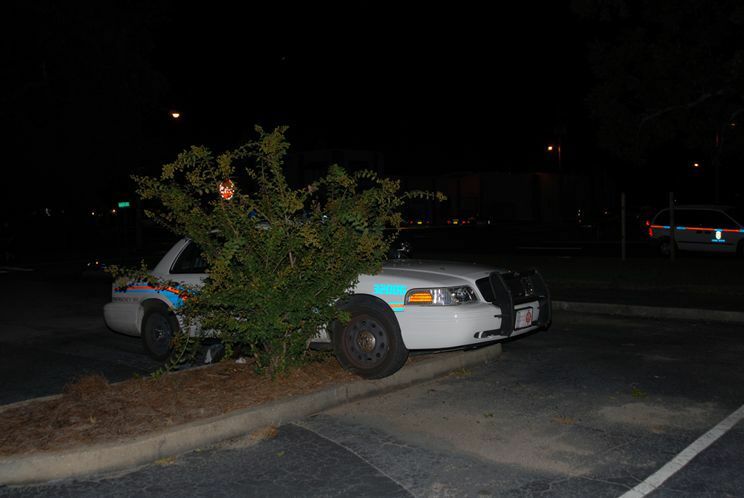 Ard's personnel file also says he backed his police cruiser into a parked car in May 2008. There were no injuries, and damage to the parked car was limited to $300. The only disciplinary action was "an admonishment to drive more carefully." In November 2008, Ard was cited for attempting to book a woman on a non-criminal offense that occurred during a traffic stop. When Ard took the woman to the Escambia County Jail, he learned that she could not be arrested on that charge. "Officer Ard was cautioned that this was his second time to un-arrest someone, even though the circumstances were different, it was starting to hint of a pattern and that he needed to check more closely," Sgt. Timothy Gaudet wrote in a report. Kinsey characterized Ard as a "good officer." In December 2007, Ard helped a Pensacola woman locate her runaway daughter. "He had a serious talk with her so I think he has made an impact," the woman wrote in an e-mail. "I can't thank him enough for taking charge of the situation and handling it so well. You should be proud to have him on your force." Chief John Mathis recognized his work. "Often times we do not devote the time to help people in such matters," Mathis wrote. "This goes to show how one incident can have a positive impact on the lives of the people we serve." Andrew Torres said he watched 17-year-old Victor Steen die beneath the wheels of a police car last weekend. "It's horrible," the 23-year-old said. "I know this is a major problem in many cities around the country, but it's really impacted our local community and shocked us out of our apathy." Torres and about three dozen teenagers and 20-somethings gathered Wednesday behind the End of the Line Cafe on Wright Street talking about Steen's death. The group plans to march and ride bikes from the Pensacola Police Department at 5 p.m. today to attend the 7 p.m. City Council meeting at City Hall in downtown Pensacola to draw attention to the incident. Steen died early Saturday while being pursued by Pensacola police Officer Jerald Ard. Police said the teenager was seen lurking near a Brownsville construction site. Ard fired a Taser stun gun from his moving vehicle. Steen then crashed his bicycle and was struck by Ard's cruiser. Torres was one of seven people standing outside Sluggo's, a music venue, when the 17-year-old was killed. Three law enforcement agencies are investigating the deadly crash. Many who attended the meeting Wednesday said Ard acted irresponsibly. Rusty Black, 24, read aloud excerpts of news reports and eyewitness accounts of Steen's death. "The real question is how can we act responsibly and effectively in this situation to honor Victor Steen and try to do something about not letting this be swept under the rug," Black said. Many at the meeting said they are eager to canvass the Brownsville neighborhood where Sluggo's is located and talk to residents. The group also is considering inundating local media outlets with letters, drumming up national interest on the Internet and staging regular protests. "Any sort of action we take should be about police reform and about how the police are trained and monitored," said Lara Lookabaugh. "It's not only about Brownsville. It's a problem about the way the officers are trained." An Escambia County judge decided Monday that a 17-year-old bicyclist's death was "an unfortunate accident" and recommended that criminal charges not be filed against the police officer who pursued him. Escambia County Judge John Simon concluded that Officer Jerald Ard's pursuit of Victor Steen after spotting him in the early morning hours of Oct. 3 was lawful. Steen died after his bicycle struck a curb in a Brownsville parking lot during the chase, and he stumbled into the path of Ard's cruiser. "The death of this young man is truly a tragedy," Simon wrote. "One can scarcely imagine the grief and profound loss that the Steen family has experienced or the emotional toll endured by Officer Ard. However, not every fatality, regrettable as it may be, necessitates a finding of probable cause that a criminal offense has occurred." Steen's death led to a flurry of protests over what some considered police misconduct and an unfair pursuit of the teenager. · Ard was justified in trying to stop Steen for improper bicycle illumination and for fleeing in what is considered a "high-crime area." · Steen didn't stop despite four warnings over a loudspeaker. · The officer did not strike Steen's bicycle with his cruiser. The in-car video shows Steen falling into the path of the car on his hands and knees. · It was physically impossible for Ard to stop or avoid striking Steen upon entering the parking lot. The State Attorney's Office will decide soon whether to follow the judge's recommendation not to file charges, Assistant State Attorney Greg Marcille said Monday. Police Chief John Mathis will decide independently whether Ard should face any repercussions within the department. Mathis will review reports from the Florida Department of Law Enforcement, the Florida Highway Patrol and Simon's decision before making a decision within the next couple of days, Assistant Chief Chip Simmons said. Ard currently is on desk duty. Mathis' options range from returning Ard to patrol duties to dismissing him. Roy Kinsey, attorney for the Fraternal Order of Police, said the police union would fight a dismissal. Much of February's coroner's inquest focused on the testimony of witnesses who saw the cruiser strike Steen near the Sluggo's music venue. Simon's ruling addressed what he called several inconsistencies in their statements, including how fast Steen was peddling his bicycle and the path Ard took when he entered the bank parking lot. "Although several witnesses indicated concern over the officer's use of a vehicle to pursue a bicyclist and the use of his Taser, no witnesses indicated that Officer Ard attempted to intentionally strike Mr. Steen's bicycle with his patrol vehicle during the pursuit," Simon wrote. Ard said he attempted to make a "citizen contact" with Steen, and the teen changed his direction and peddled away. The cruiser's dashboard video recorded the officer ordering the teen to stop on at least four occasions. When Steen ignored the officer's command, he broke the law, Simon wrote. "Under the law, this unprovoked flight which occurred in a 'high crime' area created a reasonable suspicion of criminal activity justifying an investigatory stop," the judge wrote. Simon wrote that Ard did not have time to react as Steen stumbled from his bicycle after striking a curb and into the path of his car. Ard also fired a Taser stun gun through the window of his moving police cruiser shortly before the chase's deadly conclusion. One Taser bolt pierced Steen's shirt. But several witnesses stated that the Taser had no effect of Steen and didn't affect his ability to operate his bicycle. As a result of the case, the Police Department changed its policy so that officers are not allowed to fire stun guns into or from moving vehicles. An emergency medical technician who arrived on the scene found a 9-mm pistol loaded with .380 bullets in one of Steen's pockets. He also had additional bullets in another pocket. The Steen family has given the City of Pensacola notice that it intends to file a wrongful-death lawsuit against Ard and the Pensacola Police Department. Family attorney Aaron Watson could not be reached for comment Monday afternoon. Joshua Solanas, a student who became involved with the protests as the case unfolded, said that he was not surprised at Simon's decision. "Police wake up dehumanizing a large portion of people every day and that's not going to be addressed in any inquest or in an easy convenient way because it involves a lot of tough questions," he said. The Pensacola police officer cleared of criminal wrongdoing in the death of a teenage boy will return to patrol duty after serving a two-week suspension. Chief John Mathis suspended Ard for "violating department policies" regarding vehicle pursuits, Assistant Chief Chip Simmons said. The policy states that a pursuit should be stopped when an officer determines the risk of injury is outweighed by the necessity of a suspect's arrest. Lawyers for the Steen family have indicated Ard could have abandoned the chase in his cruiser and taken other actions. Ard has been on desk duty since the teen's death. "There is no way I can adequately express our sadness for the death of this young man. This is a very sad and tragic event," Mathis said. "Unfortunately, it is one that the Steen family and Officer Ard will have to live with the rest of their lives." Simmons said the department would not speak further due to a wrongful death lawsuit the Steen family is expected to file. Escambia County Judge John Simon presided over a two-day coroner's inquest and ruled that Ard had not broken the law. State Attorney Bill Eddins chose not to charge the officer. Ard, who was in his cruiser in Brownsville, pursued Steen, who was on a bicycle, after spotting him at a construction site about 1:50 a.m.
Ard, using his cruiser's public address system, ordered the teen to stop. Steen did not comply. Steen died after he stumbled into the path of Ard's cruiser in a parking lot. During his pursuit of Steen, Ard drove up on sidewalks. He also fired a Taser though his open car window, though the stun gun did not affect Steen, according to witnesses. In response to a public outcry over the incident, Simmons changed the department's policies on pursuits and use of Tasers. Officers are no longer allowed to fire a Taser gun from the open window of a moving squad car or into a moving vehicle. Attorneys Bill Cash and Aaron Watson of the Levin Papantonio law firm filed notice with the city in January that they plan to file a civil lawsuit in federal court regarding the incident. They must wait six months from then to file the suit. While the family will seek $10 million, Florida law caps the amount that governmental bodies must pay at $200,000. If a jury award exceeds that amount, the case is taken to the state Legislature, which can decide whether to override the cap and pay the full amount. Cash would not comment Friday on Ard's suspension. "We will have a further comment on this at the time we file the lawsuit," he said. Ard's attorney, Roy Kinsey, didn't return a phone call seeking comment. The Pensacola Police Department revised its Taser policy Friday in the wake of an Oct. 3 pursuit that ended with the death of Pensacola teenager. Assistant Chief Chip Simmons sent a memo saying officers are not allowed to fire their stun guns out of or into moving vehicles. The issue arose because Officer Jerald Ard fired a Taser at Victor Steen, 17, who was fleeing on his bicycle from a construction site at T and Cervantes streets. Ard ordered Steen to stop at around 2 a.m. last Saturday, and when he didn't, Ard fired his Taser from the window of his moving cruiser, police said. The Taser bolt missed Steen. Steen then turned into a vacant bank parking lot near S Street, where he crashed his bike and fell into the path of Ard's patrol car, the police reported. The Florida Department of Law Enforcement is investigating the death. "While the FDLE is continuing its investigation, we're not just sitting on our hands over here," Simmons said. "We're taking a look at our own policies. If we see something we're not comfortable with, we will make a change. For this, we made an immediate change." Simmons' memo says that officers are expected to act safely when dealing with suspects who resist and use only "the amount of force reasonable and necessary to deal with the situation." "While shooting a Taser from a moving vehicle is not specifically prohibited, such use is not consistent with this standard," it reads. Art Rocker, president of the Florida chapter of the Southern Christian Leadership Conference, said the use of the Taser in the Steen pursuit was addressed during a meeting Thursday with police officials. "It's a step forward," Rocker said after hearing of the department's new policy. "I think it's good." State statutes establish minimum standards and training requirements for Taser use, but individual departments are allowed to tailor their own policies. "It's impossible to predict every possible situation a police officer gets into," Simmons said. "There are times when issues arise that we know are not consistent with our expectations and the expectations of the community." The number one rule for deploying the Taser, according to the PPD's guidelines: "Use common sense." Department policy says that physical force should only be used when persuasion, advice and warning fail. The policy says the use of a Taser constitutes a "use of force." Deadly force - using a firearm - can be used by an officer in self-defense or in the apprehension of felons. Shooting a firearm from a moving vehicle is prohibited because it's considered "generally a dangerous and ineffective practice," according to the policy. Darlene Dickey, attorney for the Escambia County Sheriff's Office, said that agency's policy does not specifically address firing from or into moving vehicles. The Santa Rosa County Sheriff's Office policy was not immediately available Friday afternoon. The FDLE's investigation into the incident could take several weeks to complete. A report will be sent to the State Attorney's Office, which will determine whether Ard should face criminal charges. Ard has been on paid leave since the incident. Steen's death spurred a public protest Thursday when witnesses, activists and Steen's family members marched from the Pensacola Police Department to Pensacola City Hall. Several protesters spoke at the City Council meeting.